Ethnic minorities are most deprived as their social fabric is getting weaker and distance to economic benefits of ongoing development work is getting wider. Poorest communities of ethnic minorities are more susceptible to many health risks due to poor living conditions, lack of access to basic services and increase violence due to social exclusion. The Programme for Development and Rehabilitation of Communities in Ethnic Minority Areas of Myanmar was funded by the Government of Japan with a total budget of US$ 6.8 million. 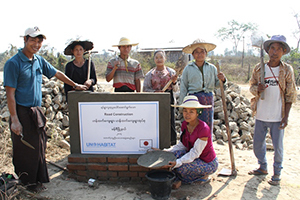 The programme was implemented in ten townships in Chin, Shan, Kayah and Kachin States supporting 509 villages benefitting 612,709 people (Male 305,814 & Female 306,895). The programme was a timely intervention for a well-defined target group who is most in need of support. It is also contributed to the enhancement of the social cohesion and building peace through development. (b) Provision of inputs, tools and skills to restore livelihoo These two combined will ensure human security and sustainable return where interventions will help improve the living conditions and the lives of the poorest households significantly, allowing for the development of a stronger social, economic and health fabric for long-term development gains. The programme consists of 3 main components, a) provision of basic community infrastructure; b) water, sanitation and hygiene promotion, and c) capacity building and training. Activities of the three components of the programme have been identified by the target communities themselves through Community Action Planning (CAP). Community water facilities were improved with the construction of 17 river water supply systems with water treatment plant with the installation of water pumps; construction of 66 gravity flow pipe water supply installation systems with overhead tanks; construction of 78 Rainwater Collection tanks of 5,000 and 10,000 gallon capacity; renovation of 8 water ponds with platforms and brick steps and construction of filter and spillway; construction of 42 hand-dug wells and renovation of 10 hand-dug wells; construction of 183 shallow tube wells with pumps installation; construction of 7 deep tube-wells with diesel pumps installation; renovation of 4 deep tube-wells with the installation of new pumps; renovated 5 min-dams/reservoirs; household water treatment facilities were improved with; household water treatment facilities (bio-sand filter) were provided to 5,461 families. Sanitation facilities were improved with: construction of 6,724 household latrines with pan and pipe/concrete ring lining; cover/compost pit. School sanitation facilities were improved with: construction of 106 school latrine facilities with hand washing facility (two units in each). Hygiene practices improved and knowledge enhanced with: conducted 488 community based hygiene education sessions with the participation of women and children. 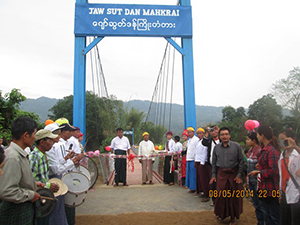 Community access was improved with: construction of 40 small bridges; construction of 19 suspension bridges; construction of 330 kilometers of village roads; renovations of 90 kilometers of village roads; construction of 256 Culverts and course ways; construction of 1.8 kilometers of small scale village roads to gain easy access to drinking water sources. Community electrification facilities were established with: construction of 15 village electricity power schemes; creation of access to rural electricity for households through solar power as an alternative energy source with distribution and installation of 6,724 solar power units at household level. Rural environment was improved through construction of 2 drainage/sewerage systems. Community capacity developed through: conducting 509 training sessions to train officer bearers of Village Development Committees (VDCs) on project management, bookkeeping, and infrastructure operation and maintenance; conducting 317 subject specific training sessions on operation and maintenance of community infrastructure; conducting 292 water quality testing training sessions and 85 bio-sand filter use awareness training sessions; organizing 97 Intra-village knowledge sharing training visits to share experience and build confidence. Needs of the communities identified and prioritized through wider participation with: established/strengthen 509 Village Development Committees (VDCs) in target villages; formulation of 509 Community Action Plans where women took a lead role and input their needs and priorities. Skills were developed through: conducting 58 artisan trainings on rainwater collection tank construction methods and 250 artisan training sessions on concrete FPL/Concrete ring/post.